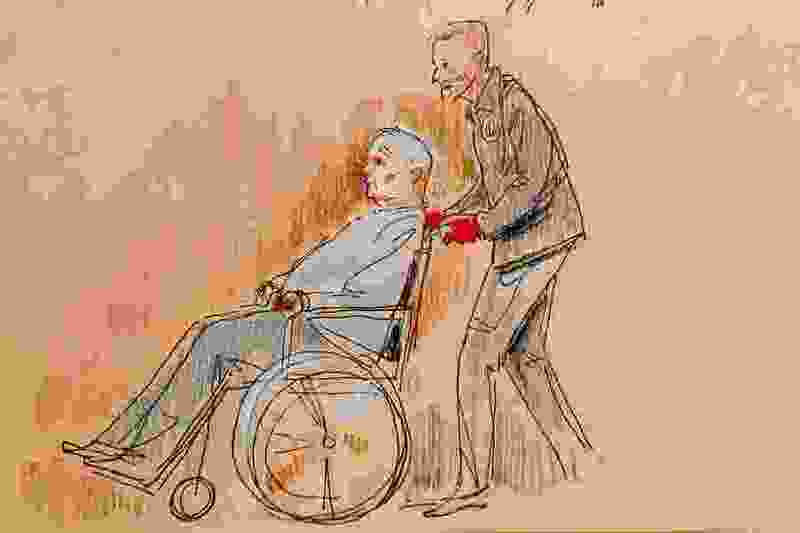 (Dave Klug | The Associated Press) This courtroom sketch depicts Robert Gregory Bowers, who was wounded in a gun battle with police as he appeared in a wheelchair at federal court on Monday, Oct. 29, 2018, in Pittsburgh. Bowers, accused in the Pittsburgh synagogue massacre, appeared briefly in federal court in a wheelchair and handcuffs Monday to face charges he killed 11 people. The suspect in a grisly shooting that left 11 people dead at a Pittsburgh synagogue was charged Wednesday in a 44-count indictment accusing him of federal hate crimes. Officials say Robert Bowers, 46, of Baldwin, Pennsylvania, drove to Tree of Life synagogue, armed with Glock .357 handguns and a Colt AR-15 rifle. The indictment charges that while he inside the synagogue, Bowers made statements indicating his desire to "kill Jews." The indictment charges Bowers with killing 11 people, and for each of those victims, he faces separate counts of obstruction of free exercise of religion resulting in death, and using a firearm to commit murder during a crime of violence. The charges carry a possible death sentence, and the Justice Department has said previously that federal prosecutors in Pittsburgh had initiated the process to seek such a punishment. The case, though, must still be reviewed by Justice Department lawyers specializing in capital cases, and the final decision will ultimately be left to the attorney general. Bowers also faces number of state charges filed over the weekend, including 11 counts of criminal homicide. Allegheny County District Attorney Stephen Zappala said Tuesday his office sought to have Bowers arraigned on the state charges but were denied by federal authorities. Zappala said that he would prefer that local residents "sit in judgment" of Bowers in a trial, but instead would let the federal case proceed and put the state charges on hold for the time being. Federal investigators concluded that Bowers legally acquired and possessed all of the guns recovered from Tree of Life synagogue and his home, according to the Bureau of Alcohol, Tobacco, Firearms and Explosives. Authorities have not said whether Bowers — who was wounded during the gun battle with police responding to the synagogue — is cooperating with investigators or detailed what he may have told them. But according to the hospital that treated him for two days after the attack, he continued making comments there about wanting to kill Jews, even though some of the nurses and doctors who treated him were Jewish.